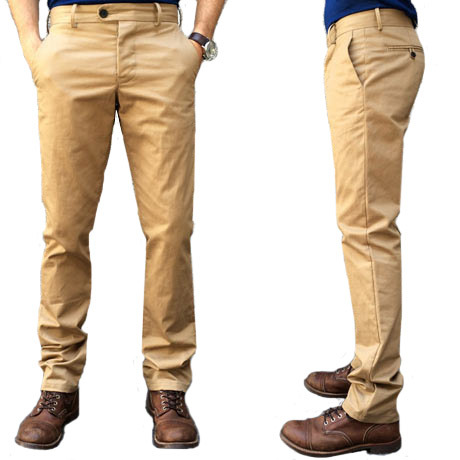 In the huge array of browns and khakis to choose from for chinos, this is a stand out shade - a rich caramel. That's probably the reason the mill just can't keep this fabric in stock. 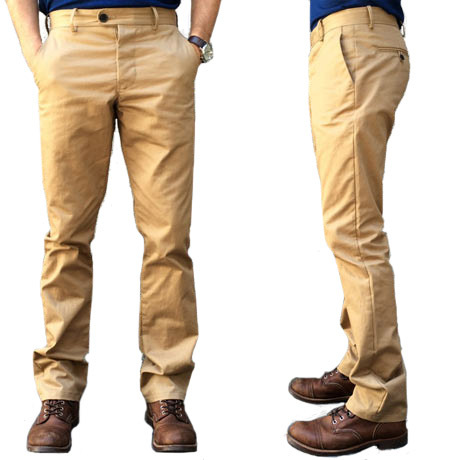 Gustin Chinos made from cotton twill woven at one of the finest mills in Japan. We're obviously huge fans of Japanese selvedge denim so we are excited to work their twills into our chino line. This style uses a rich caramel brown shade. What really drew us to this fabric was a special look to the color. It has more highs and lows in the yarn which gives the base shade a more unique look. It's not just a standard brown, but instead has a subtly aged look to it. The feel of this fabric really hits the sweet spot. It's dense enough at 9.4oz to feel substantial, but also has a super smooth and soft feel. Some fabrics have one distinguishing characteristic, either its weight, or color, or feel. This has it all. After hand inspecting hundreds of samples, we couldn't pass on this. To us, this fabric is proof enough that Japan cares as much about twills as it does selvedge denim. We're grabbing one of these for ourselves.